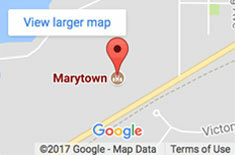 The Marytown Retreat and Conference Center is perfect for your next off-site business or group meeting or retreat. Groups and individuals of all Christian faiths are welcome for meetings, retreats, personal prayer and growth, or to enjoy fellowship with like-minded Christians. Conveniently located between Chicago and Milwaukee in charming Libertyville, it provides a perfect and comfortable setting that fosters creativity, effectiveness, productivity, and most of all, the opportunity for spiritual growth. Join the Conventual Franciscan community at Mass, Divine Office and Rosary/Benediction. For more information including rates for room rental, overnight accommodations, food service, reservations, or to tour the facilities, please call 847-367-7800, ext. 225 or email retreats@kolbeshrine.org.